This book is a sequel of Blade - After fifteen years, peaceful mother earth was re-launched with bloodshed when a Blade's protage returned. 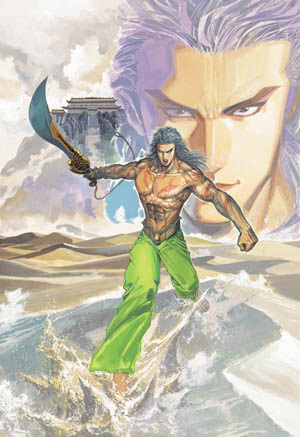 His name was Siu-Yu (霍小雨); a headstrong, eccentric man traveled with the world's most deadly sword Fierce-God (天煞). His every step was kept under close watch. Meanwhile, an unfriendly army of men possessed with evil power, led by a man with no name, were determined to do whatever it took to bring their empire back. Also, a land no life-form would dare set foot in, was hidden with a mysterious elderly who was about to impact everyone as story went. This sequel contained a new set full of its kinds, duplicity of the martial arts characters; it took a dramatic turn and shocking scene people should not be missed.